Don’t really know what to say, don’t really know how to say it. 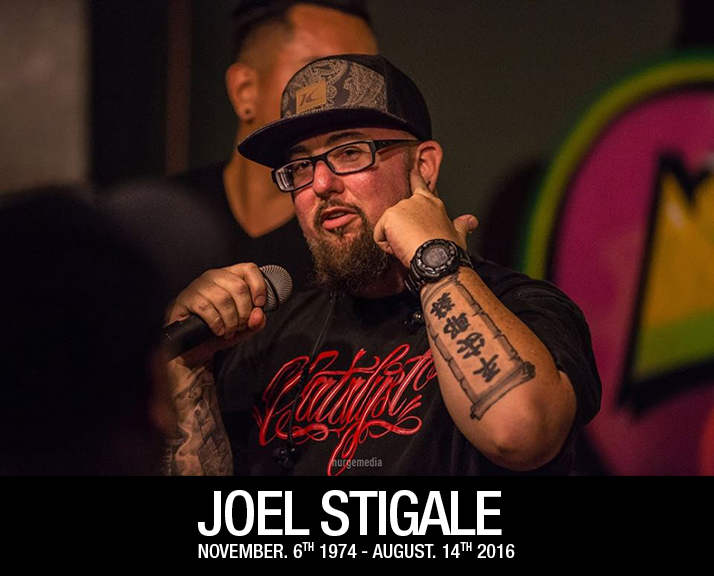 Under normal circumstances I could write and write about the impact Joel and Catalyst Hiphop had in the South Florida Hiphop Community over the last 15 years. Joel Stigale: a friend, a brother, a mentor, a role model. For the last 15 years, every bboy/bgirl that has come out of South Florida has a direct connection to Joel. Joel provided us all with a place to call home. A safe haven for us to focus and develop our arts. Every out of state/country bboy/bgirl that visited South Florida looking for a “practice spot” visited Catalyst Hiphop. I used to hang out at Catalyst in South Miami until 2 or 3am with Joel and the leaders there, just shoot the breeze, play Donkey Kong, talk about the Gospel and God. Because of this man, my life is forever changed. He impacted thousands of lives and I have the privilege to say I was able to know him for a while. Joel Stigale, I will miss you, so much. Thank you for your wisdom, leadership and friendship. Thank you for being obedient to the call of God in your life. Thank you, Vivian, for being a rock of faithfulness and trusting in the Lord in this last year. My deepest condolences and prayers for you and your family. Cant believe this day came… You impacted so many lives including mine. You gave me a place to be myself. I had years of goodtimes and met some of the best people at catalyst. I met you 9 years ago sitting by myself watching the older writers in awe… U gave us a place to paint and kept the police and violence away from us that surrounds graffiti outside of catalyst. You were the first person that preached good that i could relate to.. The first preacher i met that didnt preach down to u rather conversate with u as an equal. A mentor. I had alot of late nights full of laughs with u. Even on ur hospital bed wen i went to see u u were full of conversation bout music and graff like nothing was wrong. Ive seen u diffuse many bad occasions including ones that involved me… After every piece i did you would walk down to the wall with me and critique what i did, but yet would praise my skill to any outsider that mentioned or met me. I couldnt do half of what you did in a lifetime 3 times as long as yours. Thank you for everything youve done!! Im going to mis you. Joel will definitely be missed. He was always kind and welcoming whenever we ran into each other. Could always see the love he had for people and how much he cared for the well being of others. Could be months or even years that went by but whenever we crossed paths, it was like we had seen each other the day before. The love for Hip Hop and Christ connected us. Thankful for every conversation we had and every moment we shared. As much as it hurts to know that he has passed on, I’m filled with joy knowing he is once again healthy and in a better place. No more suffering & no more pain. Prayers go out to his family & friends, his wife Vivian and his daughter. You helped me through some really rough times and has always had my back and taught me a better way of life. For this I will never forget you. Dear Joel, I’m still in shock that you’re even gone. The previous article is Join Us At The First Ever Open Atlanta Next Month!